The fleet industry specifically has a higher-than-average truck accident rate, with many of those incidents involving fatalities. Trucks have a larger vehicular weight and longer stopping distance which makes them more likely to be involved in a crash. Because of their sheer size, a truck also has the potential to do more damage than a standard passenger vehicle. GPS tracking cameras have caught some breathtaking footage showing just how significant the damage done by trucks can be. A truck accident can affect your company financially in more ways than one. The visible costs associated with a vehicle crash will always be on the forefront of a fleet manager’s concerns, but there are hidden costs below the surface that have a more lasting impact on your trucking company’s bottom line. The FMCSA estimates the average cost of a commercial truck accident where one person was injured at $148, 279. Furthermore, a trucking accident involving a fatality is substantially more expensive at $7.2 million. It is important to note these numbers will multiply if more than one person sustains injuries. The hidden costs associated with a trucking accident can result in lost revenue 5-10 times GREATER than what visible costs entail. Since the cost of a truck accident can be affected by any number of unforeseen factors, many fleet managers cannot properly incorporate these expenses into their budget plans ahead of time. A tarnished online reputation can result in the loss of trucking business which is an incalculable cost. In the age of social media, just one commercial truck accident can spread to Facebook or Yelp like wildfire, creating a public relations nightmare for fleet managers. By allowing fleet managers to oversee their drivers in real time, the cost of a GPS tracking cameras pay for themselves in saved reputations alone. If potential customers see your trucking services as a safety liability, they will be less likely to hire you and seek other options instead. This concept extends to a fleet manager’s employees as well. If your truckers see you are dispatching poor miles, paying a low cents-per mile rate, and forcing steady turnover to keep labor cheap, they will not want to work for you. With the trucker shortage at an all-time high, fleet managers cannot afford to waste diligent drivers on the road. So How Can Fleet Managers Reduce the Cost of a Truck Accident? There is no way to prevent a truck accident entirely, but there are steps fleet managers can take to minimize their losses. While these methods will not negate accident costs completely, every little bit helps. Parts and labor in the trucking industry tend to increase every year, and finding cheaper-yet-still-effective alternatives to common repairs can reduce your truck accident expenses dramatically. For example, more commercial truck fleets are turning to aftermarket and used parts than brand new ones to control truck accident costs. With the rising prices of OEM parts, economical fleet managers can save money on refurbished materials at wholesale prices for truck accident repairs. However, these parts must also meet a certain level of quality, and in some instances replacing the part time and time again will cost MORE than paying a little extra upfront, so it is always important to weigh out the pros and cons. Using less-expensive Paintless Dent Repair (PDR) services to remove minor truck dents and hail damage is another cost-effective method for fleet managers in the trucking industry. This procedure involves specialized tools that are used to rub out dents from the interior truck panel and restore the exterior to its former position. Since PDR does not require body filler, paint, or sanding, it is a much cheaper method than traditional paint repair. But the types of material inside your truck fleet can also have a major impact on accident costs. Industry reports show commercial trucks that utilize parts made from steel can save an upwards of $1,000 or more in accident repairs versus other materials like carbon fibers, aluminum and steel alloys. On the other hand, many newer commercial trucks use more expensive materials anyways, so you may not be able to cut costs with this method. That is why it is always important for fleet managers to implement an effective driver safety program to try and avoid a truck accident in the first place. Another overlooked area in reducing crash costs is approving repairs in a timely manner. Fleet managers should always plan out trucking repair costs to their commercial trucks in advance when they can. Ideally it should take between 24 to 48 hours to come to a decision. Some busy fleet managers, however, may put this off for 10 days or more. If you make an automotive shop wait longer than normal, then other vehicles will take precedence in the queue. The longer your trucking vehicles are out of commission, the more that will cost you. Finally, fleet managers should always form a network of reputable trucking repair shops to use for their crashed vehicles. Knowing you are getting the right repairs done on your truck for the right price is crucial to managing your accident costs properly. An occupational medicine provider can treat your driver’s truck-related injuries so they can recover faster and get back to work. The sooner your driver fully heals, the less you have to pay for medical costs and lost trucking hours on the road. Not only that, but partnering with an occupational medicine provider can help relieve the burden of the works’ comp process. Your provider can help prepare your truck fleet in advance before a crash accident occurs so you have a routine in place to deal with these incidents. They can help establish communication between your trucking business, your injured worker, and any third-party administrators to move the case along. Also, having a single location for all of your medical needs provides convenience for your employees, especially if they require physical therapy and follow-up appointments. Using a facility with physicians, physical therapists and other specialists all under one roof provides a more convenient and consistent treatment regiment that will save fleet managers time and money. 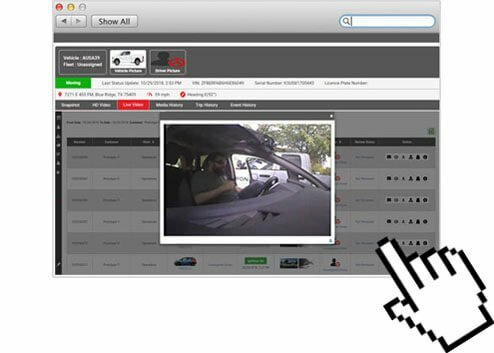 Our interior / exterior cameras give you a continual recording of road events so you can assess truck accident footage. With the abundance of staged crash accidents and exaggerated whiplash claims threatening your drivers, having video evidence of a crash is vital to reducing accident costs. Truck accidents and unsafe driving can also cause your insurance premiums to skyrocket. This can be a HUGE cost to a fleet manager’s budget in the long run. With our truck fleet cameras also known as GPS tracking cameras, you can provide video evidence from a crash that will have a huge impact on your renewal rates — in some cases lowering them by up to 10%. Insurance claims can also be sorted out faster with crash footage, which in turn makes the process cheaper to resolve. But what if one of your drivers causes an accident themselves? Many fleet managers in the trucking industry are fearful they will be incriminating their employees if they install a truck dashcam, but the scary truth is CAR DRIVERS are generally found at fault in 81% of roadside accidents. If you can avoid just ONE lawsuit from a crash, then the money saved in legal fees could pay for the cost of our GPS tracking cameras 10 times over. A truck accident can happen at any time. While there is no realistic way for fleet managers to avoid them entirely, they can at the very least take preventative measures using our truck fleet cameras. 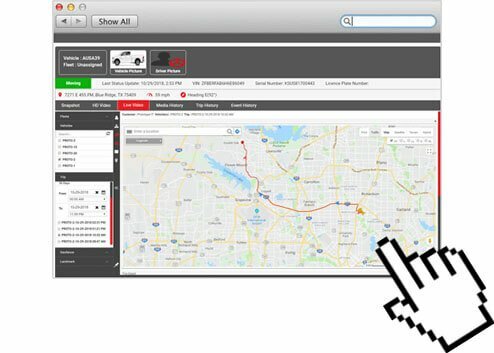 Being able to visually monitor your drivers on their trucking routes gives you peace of mind for your operations. Using trucking data provided by our cameras, you can track incidents of speeding, hard braking, hard turns and other unsafe behaviors that can cause a crash. Distracted driving is the #1 cause of crash accidents and accounts for approximately 25% of all vehicle fatalities. According to the NHTSA, there are around 481,000 drivers using their smartphones while driving on any given day. Not only does this increase the likelihood of your drivers getting into a truck accident, but they could very well cause a crash themselves. Before GPS tracking cameras, there was no way for fleet managers to verify if their drivers were texting while driving. Thankfully our systems can give you the ability to visually investigate suspicious patterns of driving and curb dangerous trucking habits. For example, if you see a string of hard braking alerts, they could be the result of distracted driving. Showing your drivers footage of themselves breaking these rules has much more of an impact on modifying driver behavior. Fleet managers should not only be concerned with their drivers getting into a truck accident, however. Many states have enacted laws that prohibit text messaging while driving. Since these are primary enforcement laws, an officer may issue a ticket without any other traffic violations taking place. As of 2018, the accident crash rate for truck fleets has increased to a staggering 20%. Being prepared for a worst-case scenario is the best precaution fleet managers can take for their business. Our cameras help you run a safer fleet by visually monitoring your drivers throughout their daily routes. Using our interface, you can pull up snapshots / footage from your driver’s trip in just a few clicks. All trucking footage is searchable by date, time, driver AND vehicle. Anytime a crash may occur, you will be notified through a shock alert. You can then log in to review the footage to see what exactly happened. We are the first dashcam to feature a full suite of GPS tracking reports for commercial trucks. GPS tracking cameras add video footage to location data, speeding alerts and geofencing capabilities letting fleet managers do detective work to eliminate unnecessary expenses like excessive fuel consumption, unauthorized side trips, overhead costs, and more features than you can expect from tracking devices alone. Most fleets in the trucking industry already have a tracking system in place. From an operational standpoint, abandoning your current GPS provider entirely may not be the most cost-effective solution. Thankfully you can use our API integration to add live video to your current GPS system. This way you can use the fleet tracking systems you are familiar with in conjunction with driver footage. 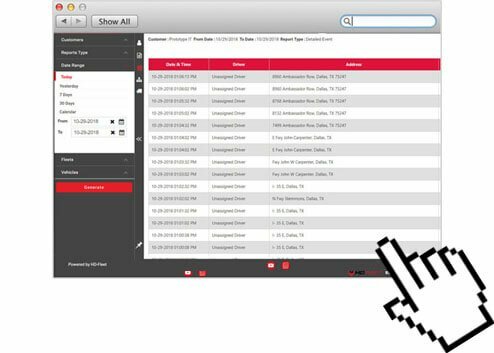 Having ELDs and IFTA under a single application gives you the most complete truck fleet management system to work with. Your vehicles are your most expensive assets, plain and simple. 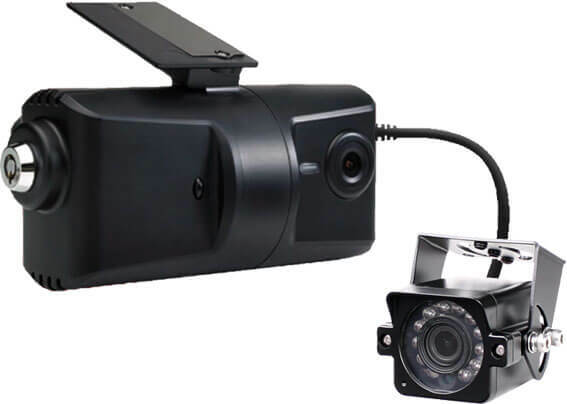 Having a GPS camera installed in plain view is sometimes enough of a theft deterrent by itself, but our dashcams can also track and identify a perpetrator if your commercial truck is stolen. Below is footage of a woman stealing a client’s truck while she is high on drugs. You can see her driving at speeds of 90+ MPH without a seatbelt before crashing into a wall. Miraculously no one was hurt, and the trucking company was reimbursed for all damages. We securely store your truck accident footage on our servers using Microsoft Azure cloud. You can always access your crash footage even if your camera is physically damaged in a truck accident. Exonerating your drivers with crash footage will cut down on truck accident costs dramatically and save your commercial truck fleet THOUSANDS. 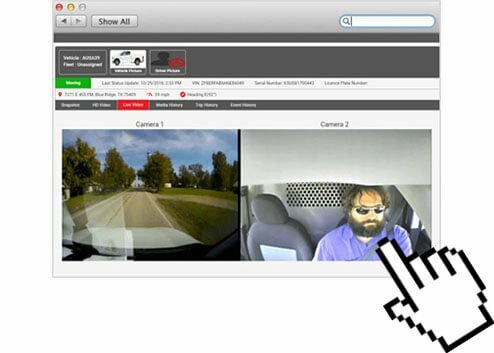 You can also use videos of your own employees to encourage safer truck driving practices across your fleet. Showing videos of your drivers brings about a self-awareness that will make them more conscious of their driving habits. 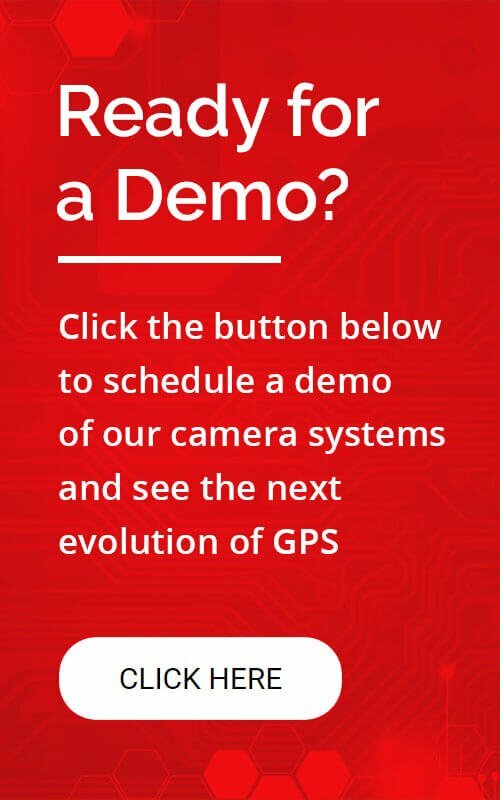 Our GPS tracking cameras come with month-to-month subscription plans as well as leasing options. If you are a fleet manager interested in getting a demo of our truck fleet systems, contact us. Call (888) 433-5338 or send us an email at info@hdfleet.com today. We also have reseller programs with labeling options available. Contact us today to learn more.